What does a medieval city in South India have in common with Washington, D.C.? How do people in Kashmir envision the freedom they long for? To whom does Delhi, city of grand monuments and hidden slums, actually belong? And what makes a city, or any place, home? In ten intricately wrought essays, renowned author Githa Hariharan takes readers on an eye-opening journey across time and place, exploring the history, landscape, and people that have shaped the world’s most fascinating and fraught cities. Inspired by Italo Calvino’s playful and powerful writing about journeys and cities, Harihan combines memory, cultural criticism, and history to sculpt fascinating, layered stories about the places around the world—from Delhi, Mumbai, and Kashmir to Palestine, Algeria, and eleventh-century Córdoba, from Tokyo to New York and Washington. In narrating the lives of these places’ vanquished and marginalized, she plumbs the depths of colonization and nation-building, poverty and war, the struggle for human rights, and the day-to-day business of survival. 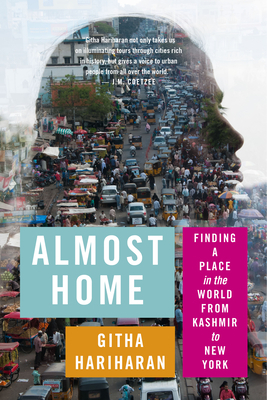 Almost Home: Finding a Place in the World from Kashmir to New York presents a new kind of travel writing that is intellectually adventurous but never detached, couched in personal experience but deeply engaged in the world, inviting the reader to make surprising connections with her own sense of home. Born in Coimbatore, India, Githa Hariharan grew up in Bombay and Manila. She was educated in those two cities and later in the United States. She has worked as a staff writer for WNET-Channel 13 in New York, an editor for Orient Longman, a freelance professional editor for a range of academic institutions and foundations, and visiting professor at a number of international universities. Her first novel, The Thousand Faces of Night (1992) won the Commonwealth Writers' Prize for best first book in 1993. Her other novels include The Ghosts of Vasu Master (1994), When Dreams Travel (1999), In Times of Siege (2003), and Fugitive Histories (2009). She has also published a highly acclaimed short story collection, The Art of Dying, and a book of stories for children, The Winning Team. Her essays and fiction have also been included in anthologies such as Salman Rushdie's Mirrorwork: 50 Years of Indian Writing 1947-1997. She lives in New Delhi.